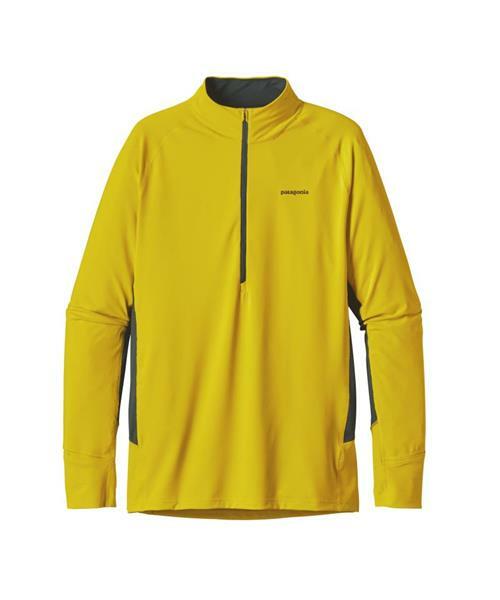 When summer won’t stay and autumn falls early, Patagonia's stretchy and supple All Weather Zip-Neck (88% polyester/12% spandex) offers enhanced coverage and breathable comfort to extend the range of wild trail runs. Worn alone or as a second layer, this long-sleeved running shirt embodies versatility. It has multifunctional cuffs with thumb holes and low-profile fold-over mitts, a deep venting front zip, and an airflow mesh back panel for maximum venting. With front and back reflective logos, UPF-15 sun protection and Polygiene® permanent odor control.